Where are my customers? Where are my key partners? Who will visit our office? What do we want them to see? Where are my executives? Where are my employees? Where is my talent pool? How do they get to work? Do we need storage? Reception area? Conference rooms? Private offices? KEY TERMS: USF, RSF, CAF, Circulation Factor . Your office size depends on both headcount and workstyle. Cubicles require fewer square feet than private offices. 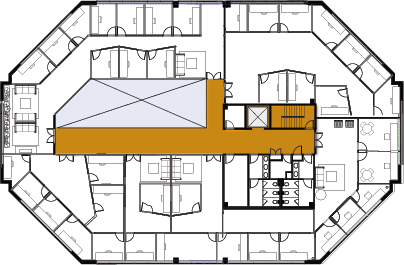 Circulation, shared space and conference rooms also impact your requirements. Here are some simple rules of thumb (plus a handy office space needs calculator) to determine what size office you need. Your office setup will affect the number of square feet per person. Here are some rules of thumb for different office uses. Businesses change much faster than most office leases. Rent enough space for anticipated growth through your initial Lease Term, especially if that term is relatively long. An Expansion Option also helps - provided the space and property you choose has more space nearby. When choosing a location, consider your major customers, executives, employees, partners, transportation, amenities and any special needs you have. Downtown CBD: Many Law Firms, Government-Related, Financial. Airport: Import/Export, Aviation, Heavy Travel Needs. Suburban: General Business, Proximity to Workforce & Customers. Adjacency Area: Industry Concentration, like Energy or Technology. 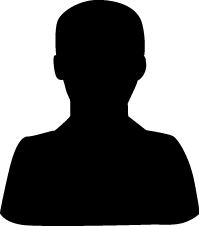 Specialized Need: Eg: Proximity to Port or a Specific Customer. Most companies prefer traditional office space, but new businesses and individuals often choose an Executive Suite. Light industrial or fulfillment-intensive businesses may opt for flex space to best fit their needs. Companies rent individual offices and share common spaces. Services if provided, are billed a-la-carte. Executive Suites are almost always billed on a Gross basis. A self-contained unit for typical office needs, including work areas, reception, conference and break rooms. Part office, part warehouse, flex space is great for companies that assemble or ship products. Typically billed on a NNN basis. 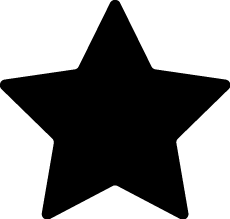 Property Class is like star ratings for hotels or restaurants. Class A buildings are newer and have high-end finishes and amenities, while Class C buildings meet the basic needs of a typical office user. Most tenants are in Class B buildings. A higher class of building is not always best. Renting Class A space is like buying a Rolls Royce; great if you can afford it, but most people can't. Also note that building class refers to the property’s physical attributes, but not to the way it is managed. Many B and C properties are exceptionally well run. As a tenant, your job is to select the right class, and then find the best located, priced, and managed property of that class. We are looking for approximately square feet of (type) space for up to employees in a Class building in (list areas of town). These requirements are likely to change, but a needs statement like this is a great starting place. Office rents are discussed in different ways depending on the market, type of space, and type of lease. Grasp the basics rent up front, then adjust for local practices and terms. Make sure to understand exactly what is included in your rent, In a Gross or Full Service Lease, the tenant pays rent and the landlord handles everything else (similar to an “all bills paid” apartment lease). The other end of the spectrum is a Triple Net Lease or NNN Lease, where rent covers the right to use the space, and the tenant pays the cost of insurance, taxes, repairs, and utilities, either through the landlord as a separate charge, or directly to vendors. In between are various modified versions of the Gross Lease, including the popular “Gross + Electric” lease. *Tenants contract directly for these items or (particularly in multi-tenant office buildings or shopping malls) the landlord manages these items and bills the tenant. Usually Lease Type deals with the mechanics of paying expenses and arranging services, but even in a Gross Lease the tenant usually bears the risk of expenses increasing. A different set of lease provisions, known as Expense Pass-Throughs or Escalations, addresses the risk of increased expenses to the Tenant. The actual space dedicated to a tenant is called Usable Square Footage (USF), which is what you will find if you measure your office. When landlords refer to office space, they typically use Rentable Square Footage(RSF), which is USF plus an allocation of Common Areas (corridors, bathrooms, lobby, and mechanical or storage rooms). Depending on the property configuration, the Common Area Factor (CAF; a percentage added to the USF to get RSF) can range from 12% to 20%. CAF is used in multi-tenant office buildings, but is less applicable to executive suites, flex space, and full-floor or full-building tenants. Most landlords quote suite size in rentable square feet. Ask what the factor is though to better compare your leasing options. Office rent is typically quoted as a monthly or annual cost per rentable square foot. Executive Suites are typically quoted as a total cost per month. rent basis without reference to square footage. All square feet are not the same; it is ok to pay more per square foot for an efficiently designed space that meets your needs than for one that leaves wasted or underutilized space. Also, remember to adjust for different Common Area Factors between properties. 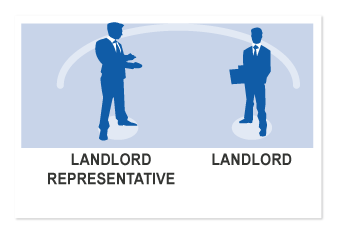 Many small and medium sized tenants deal directly with the landlord, reducing costs by cutting out middle men.Tenants can also choose to hire a Tenant Rep broker to help find space, and Landlords typically have a Landlord Rep of their own to handle leasing. Referral Services market heavily where tenants look for space, then sell the leads to other brokers. Tenant Rep Brokers often tell their clients that “the Landlord pays” and that “there is no charge for our services.” Although the Tenant does not write a commission check, the money clearly comes from somewhere. Brokers make up to 5% of the total rent over the entire lease. Paying this fee makes a Landlord less likely to spend on improvements, grant Concessions, or lower rate or deposit, and Landlords are more sensitive to a Tenant’s credit when they have to pay commission up front. Looking for office space used to be like planning a vacation, except you would call a broker instead of a travel agent. These days, there are many self-service online options to find an office. Online searching is less expensive than using a broker and more efficient than driving around town, although many still prefer these approaches. The internet is a great tool for disintermediation and increased efficiency, but in commercial real estate it can also contribute to the problem. Watch out for Referral Services as they increase costs without adding significant value. Look for listings that put you in direct contact with a Landlord or Landlord Rep.
Time spent searching for office space is time away from your core business. Compress the process by grouping tours into a defined timeframe, using a standardized tour form, and comparing the spaces you tour against your defined needs. Are expansion spacing options available? What is the Common Area Factor? • Define your needs in advance. • Skip properties that just don’t work. • Have a standard set of questions. • Invite required approvers to tour. • Speed counts; don't drag it out. Commercial leases can have hundreds of terms and conditions. While all clauses are important, the biggest items are Rent and Term(followed by Expenses, Improvements, Options, and other key provisions that are important to understand). It is easy to get bogged down in the lease process, but with some foresight and understanding you can move quickly and get back to business. and begins any Tenant work. 9 Commencement Lease formally begins; rent typically starts upon commencement. 10 Move-In Now the real work begins . . . Larger companies typically have time for a lengthy leasing process. They have existing space, plan ahead, and rarely have to leave quickly. Smaller and new businesses often have to be nimble, move faster, and adjust to changing conditions. The “time to lease” can be reduced by finding move-in ready spaces and working with a landlord’s standard lease document. The most basic lease clauses are Rent and Term – how much you will pay and for how long. By this point you should understand the different styles of Rent (Gross, Gross + Electric, Modified Gross, Triple Net Lease) and be comfortable discussing Rent on a monthly or annual per square foot basis. Now, lets turn to the nuts and bolts of Lease Term. This example shows a 3 year Initial Term followed by a 2 year Option Term with a 60-day notice requirement. A Security Deposit of one month rent is paid before the Commencement Date. In this lease, there are Rent Steps (or Rent Bumps) that automatically increase the Base Rent in Year 2 and Year 3, and also in the Option Term. These increases are unrelated to expenses (see below). Tenants may be able to negotiate various Concessions, such as Abated Rent (“Free Rent”), Tenant Improvements, reduced or waived Security Deposits. The ability to get these Concessions depends on Landlord’s situation, market conditions, building occupancy, and other factors that may be beyond a Tenant’s control. Landlords like longer term leases. If a Landlord pays for Tenant Improvements, they want a longer term to recoup their investment. Also, banks and buyers assign more value to longer leases, making Landlords like them even more. Brokers also prefer longer terms as commissions are based on the entire lease term. All of this leads to pressure on Tenants to sign longer leases. Tenants, however, often prefer shorter term leases as they provide more flexibility and require less financial commitment. These Tenants can increase bargaining power by choosing spaces that do not need costly improvements, and by leasing without a Broker In other cases, a Tenant may want a longer lease to lock in a low rate or provide certainty for the future. 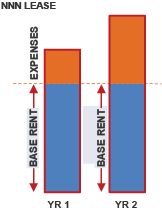 Base Rent in a NNN lease never includes expenses.Tenants pay them, in addition to Base Rent, from the outset. Expense risk keeps Landlords awake at night. If income (rent) is fixed and expenses increase, profits decline. So, Landlords seek to shift expense risk to Tenants. One way is a NNN Lease, where Tenants pay all expenses and bear all the risk. This works best where a Tenant has actual control over expenses, as in a single-tenant building or Flex Space with no Common Area. But in a multi-tenant property, where Tenants don’t really control expenses, a NNN Lease does not make as much sense. 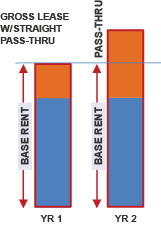 In a Gross Lease with Pass-Throughs, Base Rent in year 1 includes expenses; future years' increases are billed separately. Multi-tenant Landlords have developed other ways to shift some or all expense risk to their Tenants. Some leases (such as Gross + Electric or Modified Gross) shift only certain expense categories to the Tenant. Another approach is to pass through only the increase in expenses above their level in the year the lease was signed (the Base Year). This is called a Pass Through Escalation. One complaint is that a straight Pass Through is too good at shifting risk, removing Landlord’s incentive to economize. Tenants can mitigate this with an Expense Stop, ( Landlord pays the first part of an increase up to a certain level), or with an Expense Cap (Tenant pays the first part of an increase, up to a certain level). Finally, some leases feature a simple CPI Escalation, which uses an objective measure of inflation to adjust the Base Rent, and eliminating the need to audit your Landlord's expenses. Landlords bill escalations by estimating what the expenses will be in an upcoming year, and charging 1/12th of that estimate each month. After year-end, they reconcile actual expenses with the estimate and charge (or refund) a true-up amount. So what’s the upshot of all this for a Tenant? Generally it is best to i) limit or cap your exposure to expense increases, ii) make sure there is an incentive for Landlord to spend wisely, and iii) use objective, easily definable measures to determine escalations. Tenant Improvements (or TIs) are improvements inside an office space, typically to change layout or upgrade finishes like paint, flooring, and trim. TIs can also include signage, data connectivity and wiring, and other custom elements. For spaces needing work, Landlords may provide either a Tenant Improvement Allowance or a Tenant Improvement Credit. These represent fixed dollar amounts that Tenant can “spend” on improvements. Landlords usually manage the improvement process, but sometimes Tenants actually do or coordinate the work. If so, Landlords will approve contractors and plans, and review work and invoices before issuing a payment or credit. The work to be done is described in a lease addendum called a Work Letter. In some cases the Tenant pays for the work itself, especially if the work is unnecessary or unique, either up-front or spread out (Amortized) over the term of the lease. How many years’ of profit does this TI Allowance represent? Would I have to do this work for any tenant, or just this one? 3. How good is this Tenant’s credit? 4. How much more rent can I get if I do this work? Tenants with good credit and long-term leases, paying high rents and asking for generic improvements will get the best deals. 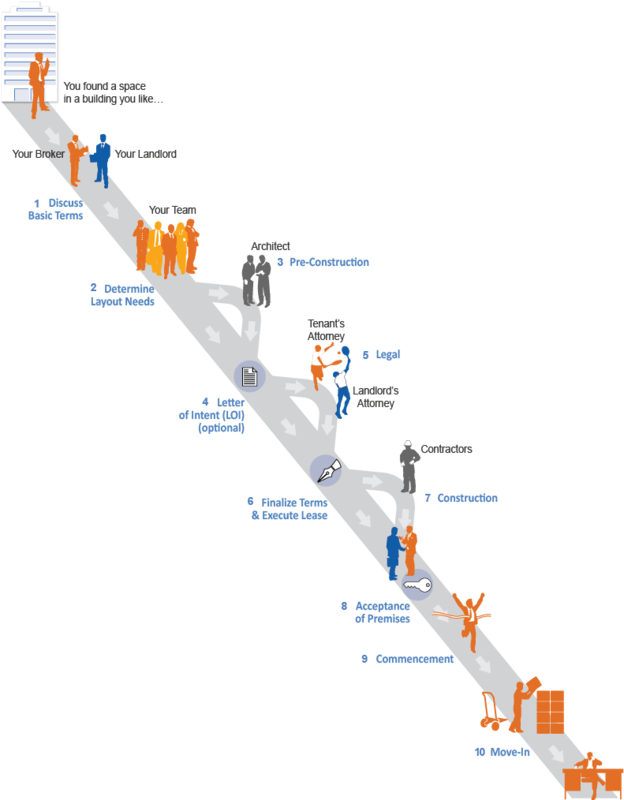 As a Tenant, the less you fit this profile the harder it becomes to get improvement dollars. Options are an important consideration for companies with uncertain business requirements. Negotiating options gives a tenant flexibility with little current cost. The easiest option for a Landlord to provide is a simple Renewal Option. Expansion Options can be challenging for Landlords in multi-tenant properties because managing multiple rights to a given space gets complicated. Options typically require the Tenant to exercise the option with an advance Notice Period, often several months or more. Expansion Options affect the amount of space rented, while Renewal Options relate to the Lease Term. A related concept are First Rights. A Right of First Offer gives a Tenant preference to negotiate for additional or adjacent space, while a Right of First Refusal allows the Tenant an opportunity to take a specific deal that Landlord is offering to someone else. Renewal and Expansion Options come in two basic variations when it comes to rent. Some decide at the time the Lease is signed what the expansion or renewal rate will be (often adjusted for CPI). Others indicate that a Market Rate will be determined at the time the Option is exercised. Which version is best is a matter of personal choice and varies among Tenants and Landlords. Before signing a lease, make sure you understand all its provisions. and consider smaller issues that can still make a difference to your experience in a property. The list below, though not comprehensive, covers some clauses that are worth your attention. Parking. Do you have reserved spaces, limit on number of cars, charge for spaces, and so forth. Insurance. Landlords typically require various insurance coverages, which may be negotiable. Waiver of Subrogation. Disallows pursuing Landlord for claims coverable by Tenant’s insurance. Relocation. Allows Landlord to move Tenant to a new, similar space; Landlord often pays associated costs. Assignment. Determines when Tenant may transfer the Lease to someone else. Subletting. Determines when Tenant can re-lease the space to someone else. After Hours AC. Costs and rules associated with using heating or AC after business hours. Personal Guaranty. Makes an individual liable for the lease obligations. SNDA. Provides that Landlord's lender will honor your lease if Landlord defaults.